As an IT manager, having a large number of devices under your watch can be intimidating. Sure, plenty of tasks in your workload aren’t technically challenging on a small network, such as installing business software and applying updates. 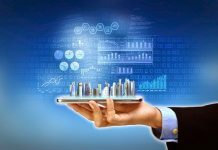 But if you need to perform them on dozens, hundreds, or thousands of devices, then you need a capable IT management software at your disposal. Cloud Management Suite is an IT management solution that will let you accomplish your tasks in a quick and streamlined manner. As the name suggests, the platform and all of its features are completely cloud-based. 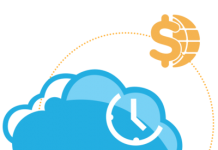 This means lower overhead costs and an easy deployment process that can be over within hours. 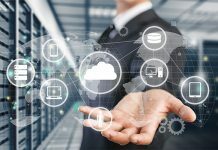 To help you decide if Cloud Management Suite is the right IT management platform for you, let’s take a closer look at its key features. The first order of business when deploying Cloud Management Suite is to run a “Discovery” task. This prompts the software to scan your business network for connected devices. Fortunately, one of Cloud Management Suite’s greatest strengths is the consolidated “Tasks” page where you can perform pretty much everything you need to do in one place. From the main dashboard, click on “New” and select “Discovery” under the “Tasks” section to complete the first step. The succeeding steps involve identiying the sites or IP ranges you want to check for connected devices. You also get to create administrator accounts, set scan schedules, manage reboot settings, and so on. This can save IT managers hours of time that they could spend in other, more meaningful activities. 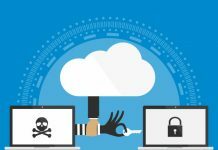 When executing commands and tasks with Cloud Management Suite, bear in mind that you usually have to specify the devices you want to target. That’s why, after a thorough discovery of your network devices, your next priority is to create the appropriate groups. Let’s say you’re an e-commerce business and use Magento 2 for your website. Rather than distributing it to your entire IT network, you simply need to create a device group for your development team and target them in your software deployment task. You will then be asked to specify a name for your new device group and manually add the members. The good news is, you can filter devices by OS or search for a device name. This makes it easier to sieve out the right devices from your network. 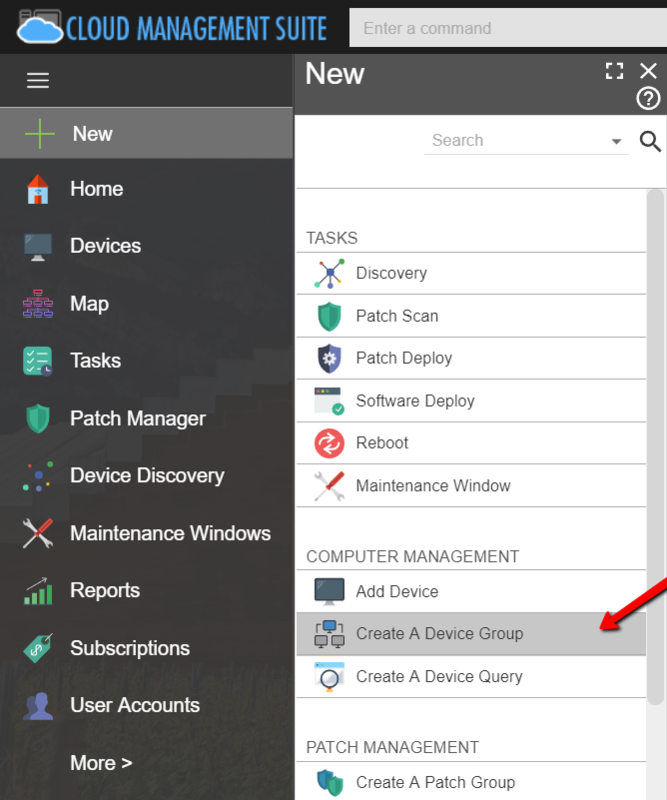 Remember, a single device can be a member of multiple groups in your Cloud Management Suite account. As such, feel free to create as many device groups as you deem fit. 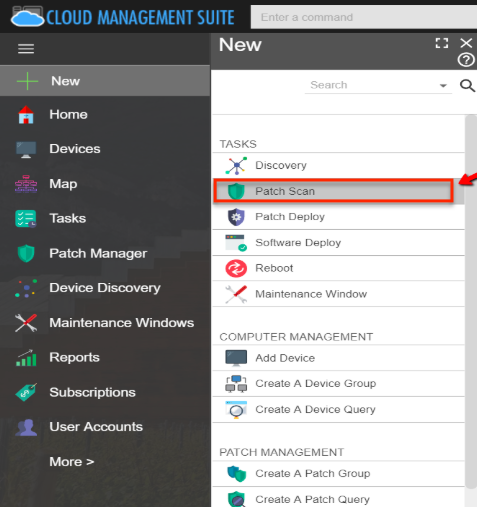 Once your device groups are set, you should now be able to distribute software patches and new installations with ease. Patches, in particular, are crucial pieces of software that make sure your devices and business network as a whole are protected against cybersecurity vulnerabilities. You then have to select your targets either through queries, groups, or a specific set of devices. 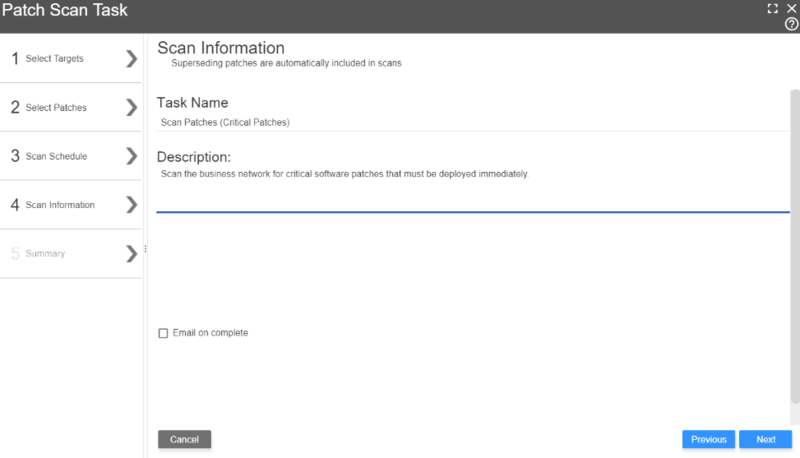 The configuration page also lets you select the patches you want to scan, set a scanning schedule, and input some details for your task. 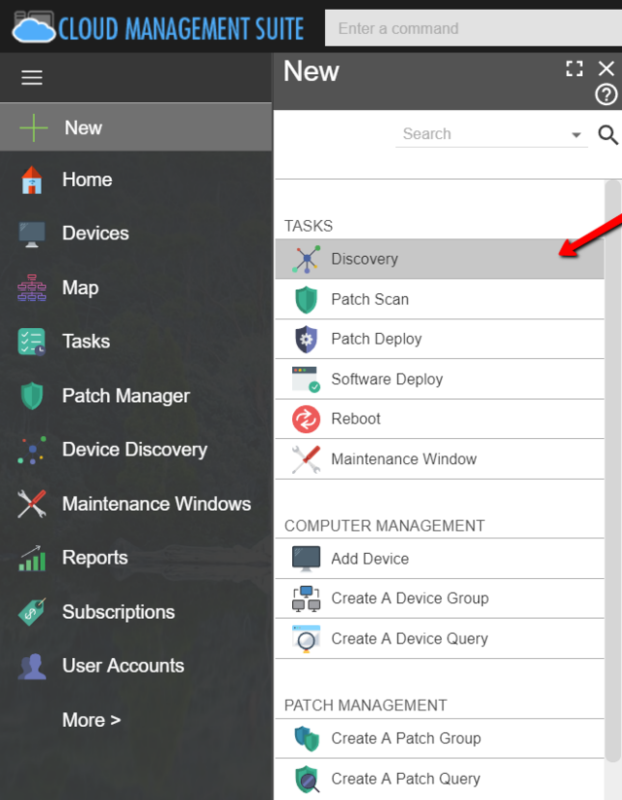 Going to “Patch Manager” from the dashboard, the overview page will show you alerts in case critical patches are detected for your devices. You should also see a complete inventory of all available patches for your software applications in the “Patches” page. The “Patch Deploy” task will allow you to apply the detected patches to target systems on demand and on schedule. Just like before, you can select your targets via device query, group, or a custom set of devices. Similar to patch deployments, you can also distribute software packages to your network devices. The only difference is that you manually have to build your software stack by uploading the installation packages to your Cloud Management Suite account. Regularly installing updates to your business applications is a great way to maintain a secure IT environment. Cloud Management Suite lets you take a step further with built-in cybersecurity monitoring tools. Going back to the main dashboard, you’ll find status monitor utilities for your BitLocker and Windows Firewall products. You can also track any existing threats in your network using the “Find Process By Hash” and “Is Process Running” tools — both of which can detect the presence of malware in real time. 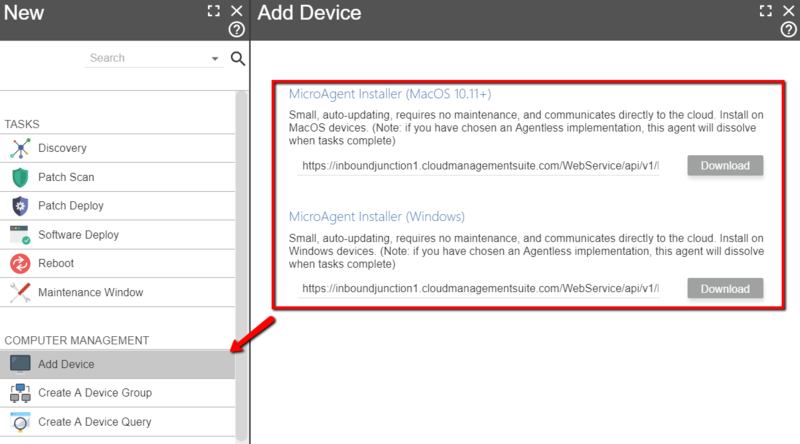 In the event of device theft, you can use the “Where are my devices” feature to locate the possible culprit within Cloud Management Suite. 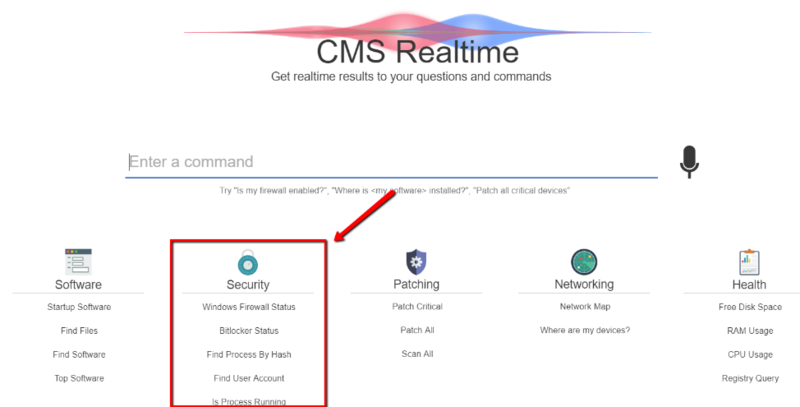 If you decide to take Cloud Management Suite for a spin and create a trial account, the first thing you’ll notice in the main dashboard is the “CMS Realtime” interface. It’s a fully functional, voice-capable search feature that lets you find answers to questions as well as head straight to the feature you need. 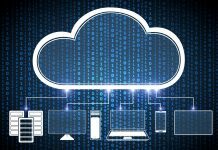 Although it doesn’t necessarily expand Cloud Management Suite’s capabilities, being able to find the functions you need without navigating through the menus is a huge time-saver. It also drastically smoothens the learning experience so you can be productive with the platform as soon as possible. In case your microphone is broken or inaccessible at the moment, don’t worry — you can simply type in your queries into the “Enter a command” field just like with a regular search engine. Overall, Cloud Management Suite is a powerful solution loaded with features that can take your IT management to a whole new level. 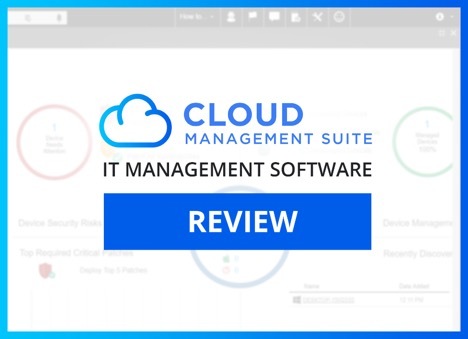 If you want a single platform where you can manage your devices, roll out software updates, distribute business applications, and monitor your network’s security, then Cloud Management Suite is definitely a great investment. Perhaps the only thing missing would be a comprehensive cybersecurity toolkit, which may include a malware scanner and a Web Application Firewall. 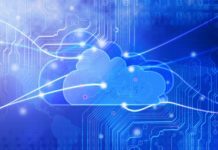 Still, Cloud Management Suite delivers more than it promises with its expansive set of features.